Guess what!? I am in Atlanta today at the Haven Blogging Conference. Eeek! It is so exciting to be here, and I can't wait to share my experience when I return home, but for now I am thrilled to show you my latest project in my master bedroom makeover, a DIY Floating Night Stand! *Update- For building plans click here. 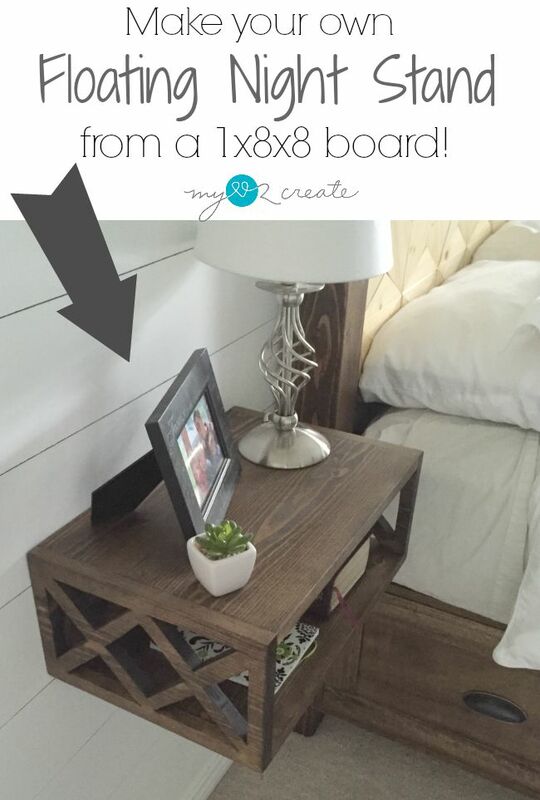 So not only do you get to see how I made my floating night stand out of a single 1x8x8 board, but you also get to see how 16 other bloggers decided to DIY their own board! Here is my newly bought board, ready to be transformed. It took me a while to come up with my plan. When you are talking night stands the width of a 1x8 board is not ideal. 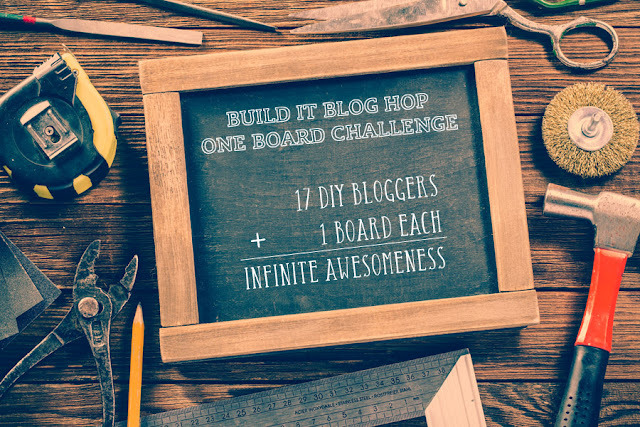 I knew I had to make my boards wider, but not too wide. So after some calculations I knew what to do. I stared by cutting four pieces from my board at 17 inches each. Then I took one of the boards and clamped it onto a table with a 2x4 under one side to raise it up (top left). 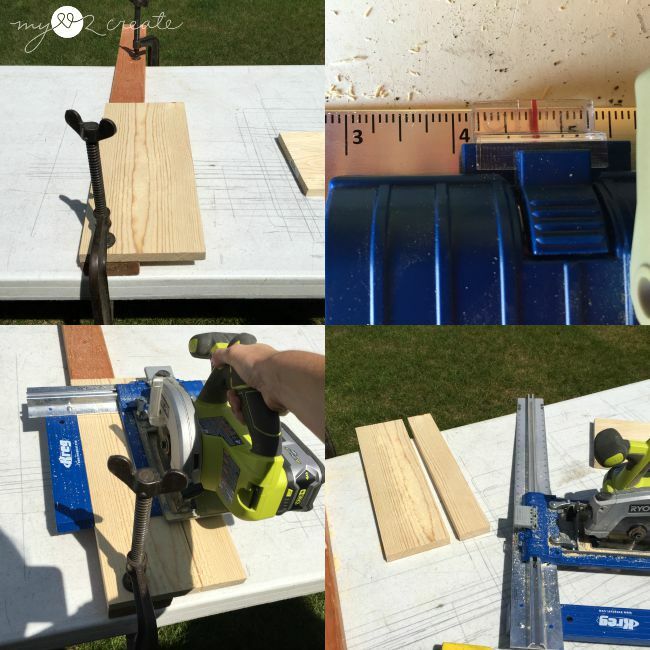 I set my Kreg Rip-Cut , my newest favorite tool, at 4 3/4 inches (top right), and partnered with my Ryobi Circular Saw (bottom left) I proceeded to rip my 1x8 board into two strips (bottom right). I did this with two boards. If you have a table saw you could rip your boards that way...but I do not. Using my Kreg Rip-Cut /Circular Saw combo, makes for straight accurate cuts when you are limited on your tools, and it makes me happy! So this is where I was after ripping my two boards. Next up...attaching the 4 3/4 boards to the 1x8 boards to make the top and bottom of my night stand. 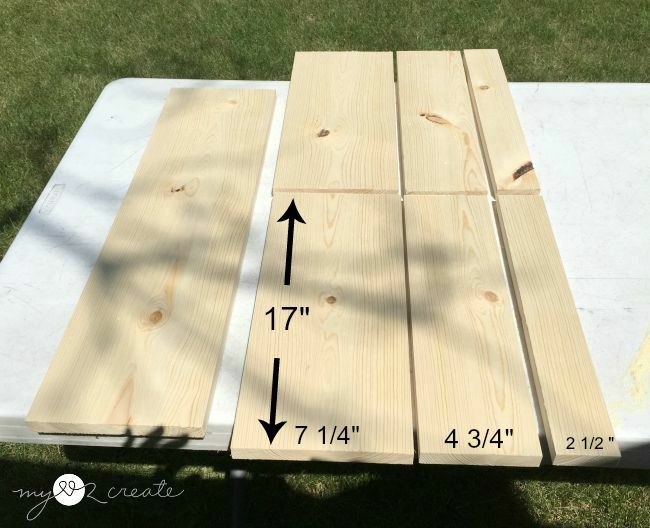 Just in case you are confused actual lumber sizes are usually a little different than the size they are called. For example this board is a 1x8 board but it is actually 3/4 thick and 7 1/4 inches wide, not 1" thick and 8" wide. Also please note that the 4 3/4 and 2 1/2 boards are slightly smaller in real life to account for the blade cutting the wood, I just gave you the rough measurements. 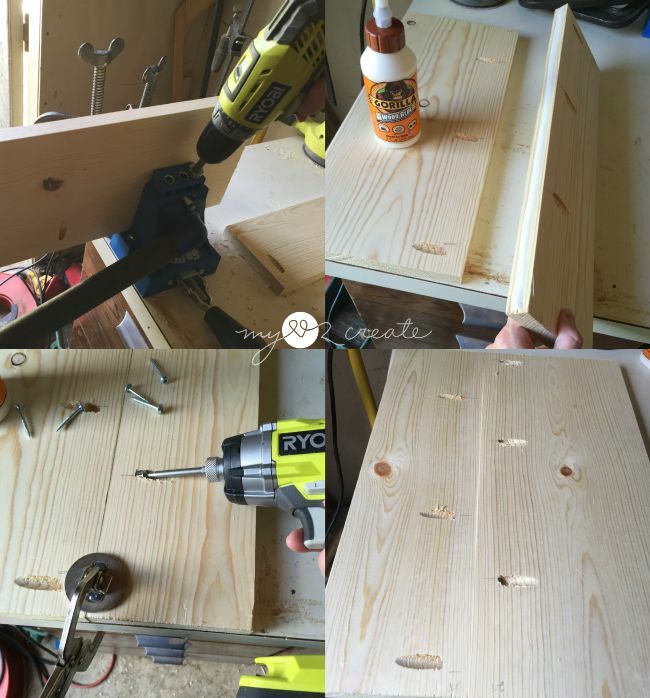 In order to attach my boards to make them as if they are one board I used my Kreg K5 Pocket-Hole Jig , which drills pocket holes that create hidden joints. I drilled three pocket hole into my 1x8x17 board and three into my 1x4 3/4x17 board, making sure to stagger them. Then I added some gorilla wood glue and clamped my boards down to screw them together. I ended up with two 1x12 x17 inch boards. Aka- the top and bottom of my night stand! This is so fun! 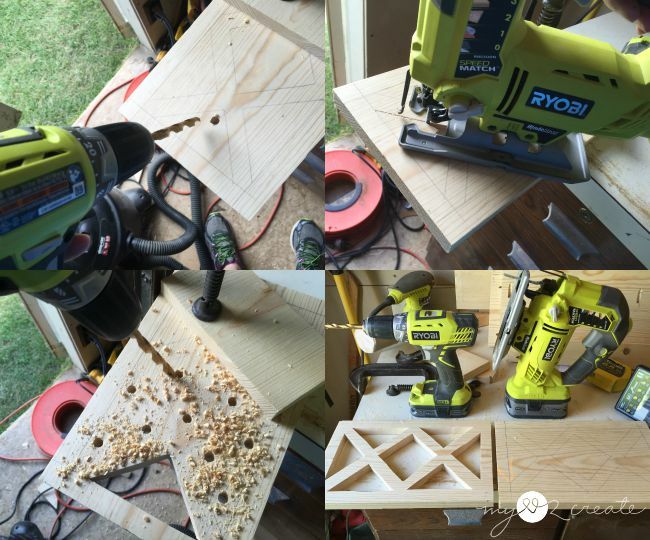 Using my new top and bottom pieces I drilled three pocket holes into each 12" side. These pocket holes will be how I attach the side pieces to the top and bottom pieces. 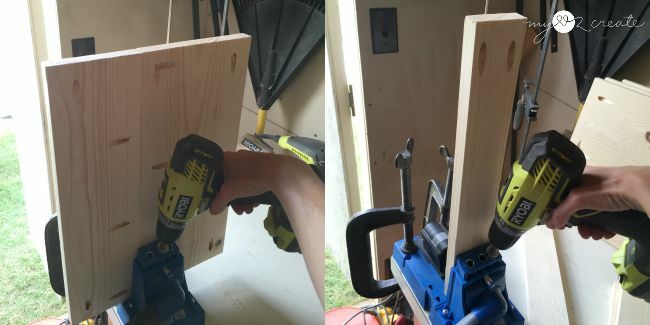 I also drilled pocket holes into my two 1x2 1/2x 17 pieces which I will use at the back of my night stand for support and for attaching it to the wall with screws. 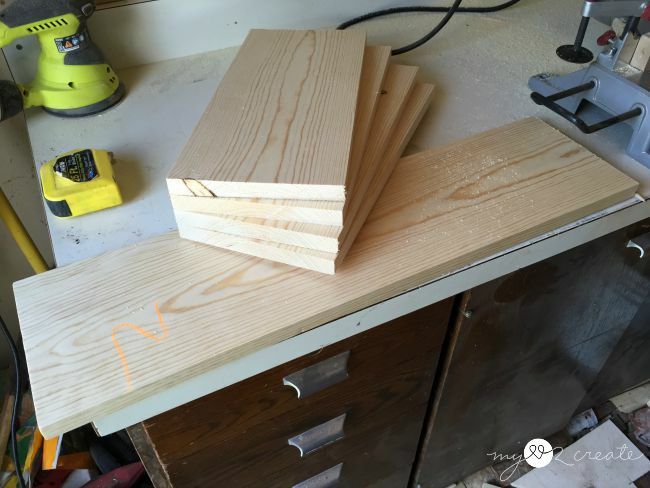 I used a top/bottom piece to measure where to cut my side pieces on my left over board. I cut two of these. The are just a hair under 12 inches wide. On the right you can see all my boards ready for building...but wait...are they ready? Nope, not quite! I couldn't just make a box, I wanted something a little more fun and fancy. So I started drawing all sorts of designs on paper and I ended up with a simple double X design. Which happens to be made completely out of triangles! To start I grabbed a side piece and a back support (top left) and used my support piece to trace a 3/4" outline around the whole side piece. This outline is vital for attaching the top and bottom boards later, it is the area the boards will be attached together. Now you could get technical and measure...but I am too lazy so I use what I have. For the double X pattern I found this scrap triangle block. It just happened to be the exact size I needed to create my pattern. and so I used it to trace 8 triangle outlines to make my pattern. I repeated the process for the other side board. Now they are ready to cut! 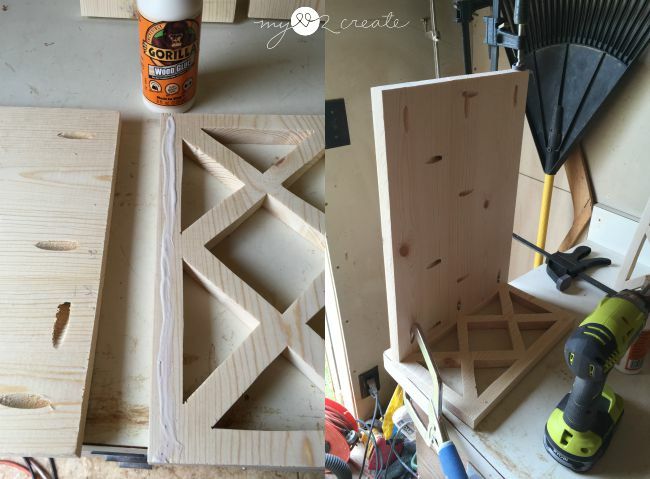 Because I didn't need the inside of the triangles I drilled holes in them and then used my Ryobi Jig Saw to cut them out. My first one I drilled just one hole. For my other ones I drilled three holes which made it easier, to cut three sides, and then cut out the smaller pieces that were left. When it came time to build my night stand I busted out my Kreg Right Angle Clamp ! These are so great to keep your pocket holes going in perfectly and accurately the first time. I LOVE them. I used glue and one clamp to add my top board to the side board. I also used a longer bar clamp in the back to hold the other side. Once I had my two side pieces attached to the top I could add the bottom piece. This time I could use two Kreg Right Angle Clamp because my pocket holes were facing the other way. Then I added the back support pieces, and I was done building!! To attach the night stand to my plank wall I screwed into the studs on one side and used drywall anchors on the other. I simply made sure it was level and screwed them in! Actually, I held my night stand at level (marked the corners so I knew where it was supposed to be). Then while still holding the night stand in place I predrilled two holes through my back supports into the wall. Next I removed the night stand and used those two holes as the spots to add my anchors. I added the screws into the pre drilled holes so they were barely sticking out the back of the support boards and then lined my night stand back onto the wall and screwed them in. Lastly I added the screws into the studs, which I had marked on the wall previously. My screws are two different screws because I used 3" self tapping screws for the studs and regular 2" wood screws for the wall anchors. It is nice and sturdy, and perfect for my beside needs! I had a hard time deciding how to finish these...I thought about painting but couldn't decide a color, Then I thought about staining them natural or dark...I literally debated for several days! My friends helped me decide to stain them Minwax Jacobean, the same as my bed, and I am sooo glad they did! I am in love. I am really digging the double X pattern, I think it gives it a certain charm. I actually did make two floating night stands, because of course my husband and I both needed one! We are using our old makeshift lamps right now, I have a fun idea for new lamps...but more on that another day! I love how this night stand does it's job and allows me to use my bed drawer without a hassle, and all it takes is one 1x8x8 pine board, which is less than $13 at HomeDepot! 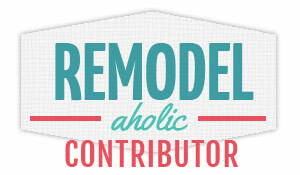 Totally worth a little DIY Love! 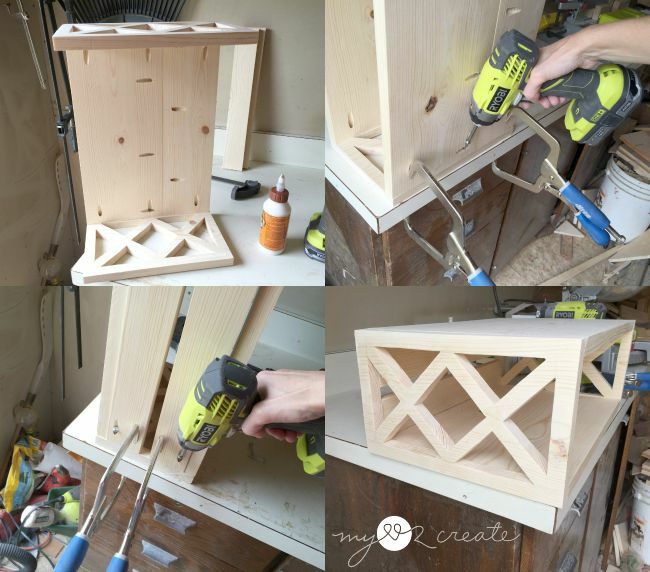 I am almost finished with the plans for this floating night stand, so look for it soon! A really beautiful table; light and airy but totally functional. I love this! I've been wanting to build a bed from Shanty 2 chic and have been putting it off because I couldn't find the perfect bedside tables! Now I have!!!!!! I'm so excited! They are beautiful. Now to go practice with my jig saw. That's so cute!! :) I love it :) You did such a great job. You are awesome! 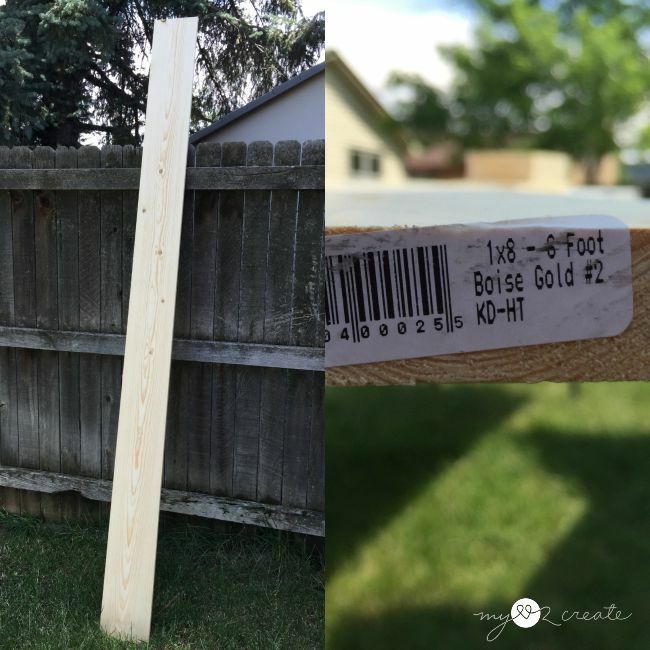 I love this project and thank you for the detailed instructions. The x cuts are fantastic! So smart, so beautiful. This is awesome, I love it! I love the job you did on the Floating Nightstand. Very, Very Clever and a great tutorial. Thank you for sharing with the Clever Chicks Blog Hop! I hope you’ll join us again next week! So gorgeous, I love the detail on the sides. Such a genius idea! I am amazed by your creativity! Wonderful, beautiful and unique! Oh my gosh Mindi! 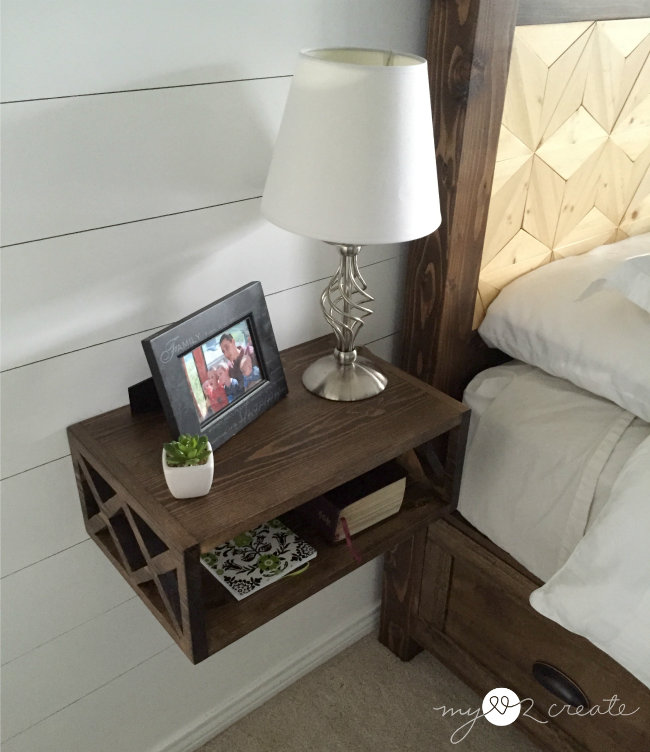 I love, love, love your floating nightstands.You did a great job girl! I'll have to hop over and check out all of the other projects. OMG I just came across your blog. Seriously? I just made a map frame using yardsticks and a hand saw and thought I was so talented. You are crazy good. Amazing and your room looks beautiful. Happy Monday. OMG! I LOVE this project! You are SOO talented! 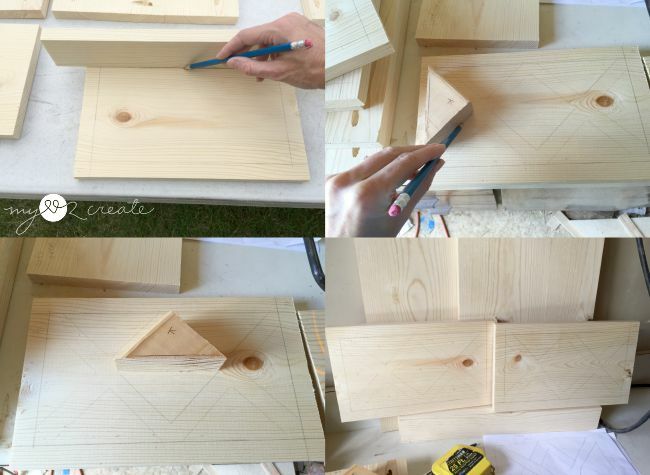 I'm getting into woodworking projects myself on the blog and this is definitely inspiring me! You are one of my features at the Talented Tuesday party tomorrow :) I hope you'll stop by and say hi! Wow! This is absolutely amazing! I'm featuring this project tomorrow at the Talented Tuesday Link Party - I hope you'll stop back by and grab a "featured" button! What an awesome project! Pinned...this is one I'd love to tackle! I cannot believe that you designed and cut out that X pattern yourself! Wow! And it truly adds so much beautiful detail to your finished night stand. Thanks for linking up with Creative Spark. I'm featuring this project at tomorrow's party. Hope you'll come link up with us again. The party starts at 6am EST! Very thorough and detailed. The size is quite reasonable, i think. Nice stand ! I like DIY project like this. Thank for share ! Holy moly, are you good!! 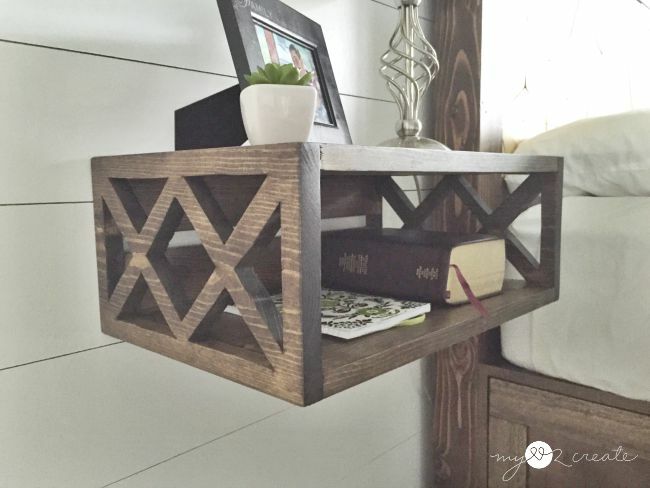 This shelf is so cool!! Awesome tutorial for peeps, too. 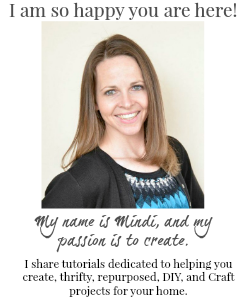 Thanks for joining us, Mindi! So impressive! 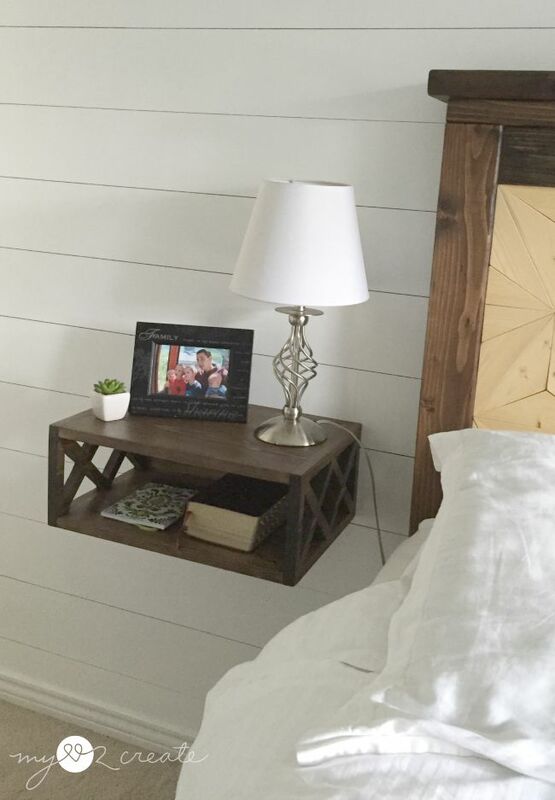 Love your DIY floating nightstand. Such a great space saver. 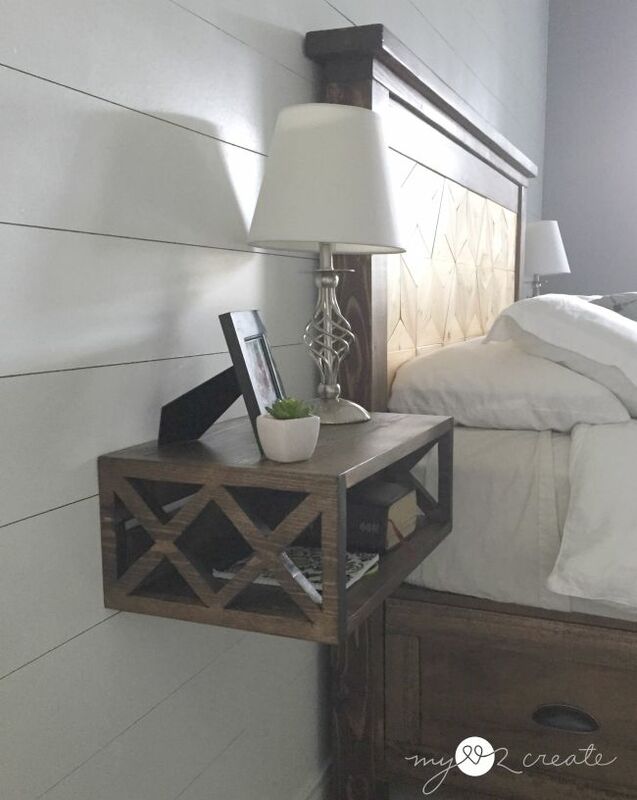 I've always loved the idea of a floating nightstand, but all the ones I've seen are either too contemporary or too expensive, I'm so excited to get making this! 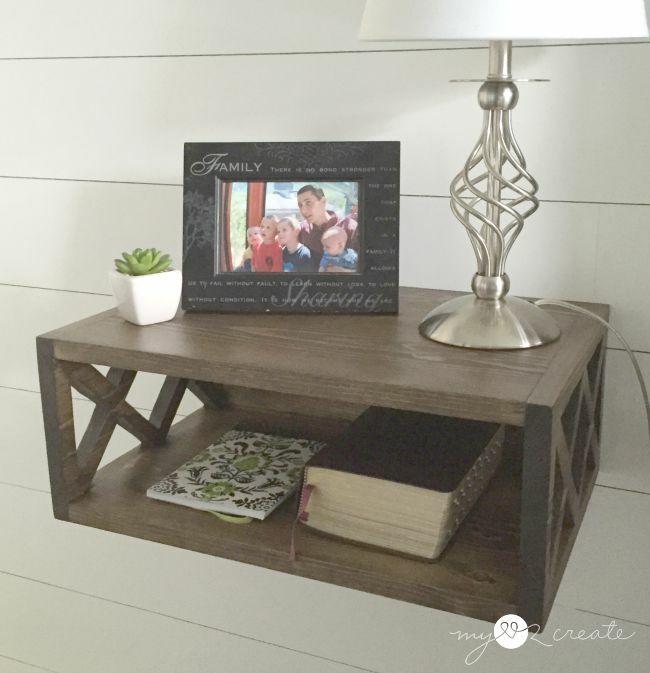 Love the nightstand, I am hopefully making one tomorrow! Can you give me the dimensions of the triangle that you used? Thanks! Awesome Jessica! 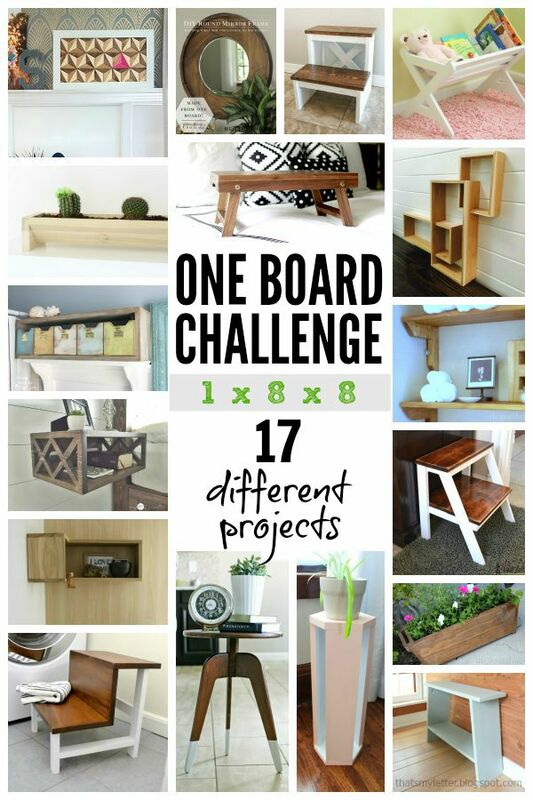 I am so excited you are going to make one! If you go to the top of this post I have a link to the free building plans, and you can get all the dimensions in that post. I hope that helps!